No added sugars. Valuable, easily digestible cereal. Vitamin B,- supports the nervous system. No added Milk. For your baby's safe and balanced nutrition. No added flavouring. HiPP Organic. The Hipp rice waffles are airy, light and ideal for small hands. With sweetness only from fruits and natural sugar content from the ingredients. Blueberry,Apple,Raspberry. Rice Cakes. Organic rice waffle with 83% rice. 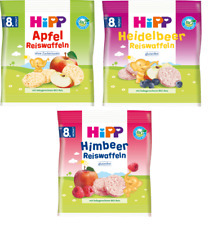 HiPP blueberry rice cakes are made ​​from puffed rice and also contain organic blueberry puree and organic apple juice. HIPP Organic Rice Cakes Snack. with Blueberry & Apple. with organic blueberry puree. HIPP ORGANIC CEREAL FLAKES. More HiPP will be listed in due course. - suitable as HA-pap. without milk. WIDTH : 13 CM. LENGTH : 20 CM. Buy all 9 mugs in our collection! ON SALE IS. 2 BOX - 30 SASHETS - 10.8 GRAMS. Hipp Baby Fennel Tea is particularly mild and pleasant. FIRST FENNEL BABY TEA. - made of 100% fennel extract. This herbal tea has well proven itself in the baby's diet. Babies from 8 months onwards will enjoy the Holle Bio Crunchy Snack millet. All ingredients are well digestible and well tolerated. The little ones should not develop unnatural cravings for sweets, but enjoy them in moderation. HiPP Organic. The Hipp rice waffles are airy, light and ideal for small hands. With sweetness only from fruits and natural sugar content from the ingredients. Blueberry Rice Cakes. Organic Blueberry rice waffle with 84% rice. HiPP Organic. The Hipp rice waffles are airy, light and ideal for small hands. With sweetness only from fruits and natural sugar content from the ingredients. Apple Rice Cakes. Organic apple rice waffle with 83% rice and 17% apple juice concentrate. HIPP BABY'S FIRST RICE ORGANIC BABY CEREAL. More HiPP will be listed in due course. - suitable as HA-pap. without milk. LENGTH : 20 CM. WEIGHT : 245 GRS. Buy all 9 mugs in our collection! ON SALE IS. Hipp Baby Fennel Tea, made from 100% Fennel, digestive tea to soothe colic! Now with Free 1st Class Post included within the UK! 5 out of 5 stars - Hipp Baby Fennel Tea, made from 100% Fennel, digestive tea to soothe colic! 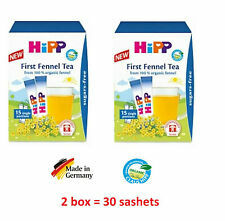 4 product ratings4 product ratings - Hipp Baby Fennel Tea, made from 100% Fennel, digestive tea to soothe colic! 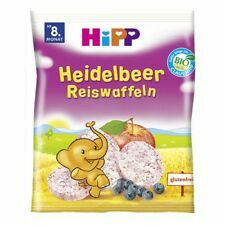 Hipp Organic Baby Food Organic Baby Rice 160G (3 Pack). Hipp Baby Fennel Tea is particularly mild and pleasant. - made of 100% fennel extract. This herbal tea has well proven itself in the baby's diet. - without addition of sugar (ingredients naturally contain sugar). HIPP FENNEL BABY TEA. HIPP COMFORT BABY TEA. - 100% organic fennel, anise and caraway. - 100% Organic Fennel Herbal Tea. Preparation: 100ml tea: Pour 100 ml (about 3.38 oz) of water into a bottle or cup and add 1/2 sachet of tea. HIPP Instant TEA NATAL MAMA for BREASTFEEDING MUMS HERBAL DRINK,200gr. Herbal tea, great combination of anise, fennel and cumin. INSTANT HERBAL NURSING TEA to Support Milk Production. Humana Fennel and Caraway Tea. Very mild Tea containing particularly high-quality and carefully selected extracts of fennel and caraway. For the special needs of mothers-to-be towards the end of pregnancy and for mothers during breast-feeding period: Aromatic Tea with a finely mixed blend of high-quality herbs and fruits. Nursing Tea. Hipp Organic Baby Food Organic Baby Rice 160G (5 Pack). 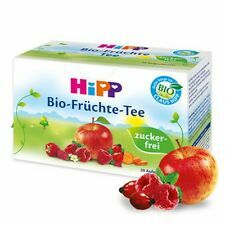 Hipp Organic Baby Food Organic Baby Rice 160g. HIPP MAMA (. Tea for Breastfeeding Mums). Herbal tea, great combination of anise, fennel and cumin. INSTANT HERBAL NURSING TEA to Support Milk Production. Pour into a cup 200ml of boiled water (warm or cold), add 4 teaspoons of tea granulate (16g) and stir.